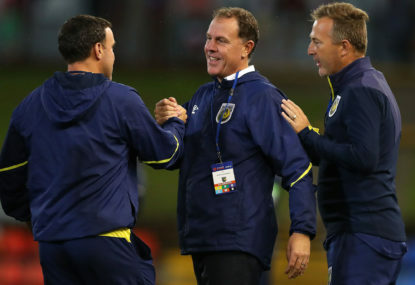 While Perth Glory bask in their Premiers Plate success and make plans to host what they hope will be a triumphant grand final on either the 18th or 19th of May, Ernie Merrick will be feeling flat, disappointed and despondent. In 2017-18 the Jets took all before them, chasing Sydney FC throughout the season and at one stage, challenging for the plate. What followed was epic for the Hunter, as the Victory stunned Sydney and Newcastle was handed hosting rights for the season finale. What a day it proved to be. 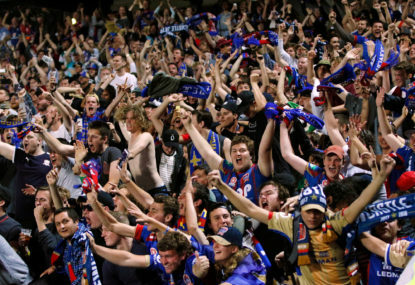 A packed and expectant house, confident that victory would be theirs now that the benchmark had been eliminated and Kevin Muscat’s men standing in their way. The history books tell that things didn’t play out to script for Newcastle. A VAR malfunction and a lone Victory goal earnt the southerners a fourth championship. Despite the loss, there was nothing but respect, appreciation and support from the home fans. 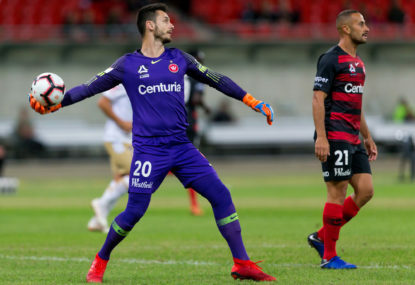 Roy O’Donovan led from the front passionately, Dimi Petratos had become something more than just a competent A-League player and Riley McGree provided some magical moments of skill and precociousness. With Nikolai Topor-Stanley and Nigel Boogaard holding the fort at the back, the Jets were not only the most explosive and lethal attacking force in the league, they were also structurally tight and efficient at the back. 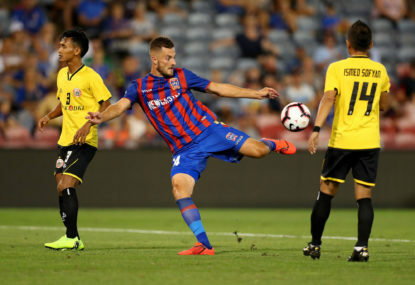 Andrew Nabbout’s mid-season move to Japan had an undoubted effect, yet Merrick was able to restructure effectively and the team hummed along regardless. The astonishing rise seemed likely to parlay into the following season. Why wouldn’t it? Aside from the loss of McGree, who ventured off to Melbourne City in the off-season, Newcastle appeared likely to put a familiar team on the pitch come Round 1. Albeit without O’Donovan – who would sit out a couple of months thanks to his Jackie Chan impersonation in the grand final. To counter the losses, a fit and firing Ronald Vargas was unleashed on the league. A heralded import, Vargas played little football the season earlier after a serious injury sidelined him. He did return for the finals and contributed, yet needed a base fitness level and some more minutes to return to full effectiveness. The off-season would provide that opportunity and as their year kicked off in Wellington, most fans had the Novocastrians pencilled in to their predicted top six. They lost that night and in Rounds 3, 6, 8, 10, 11, 13 and 15. Just four wins were collected in that period, with three draws adding to their total points haul of 15. 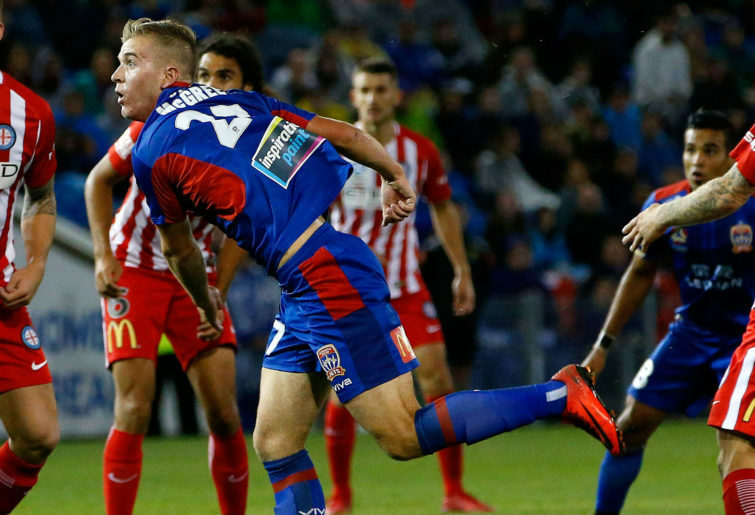 It left the Jets in a distant seventh position and well in arrears of Adelaide, Wellington and Melbourne City who were battling for positions in the top six. 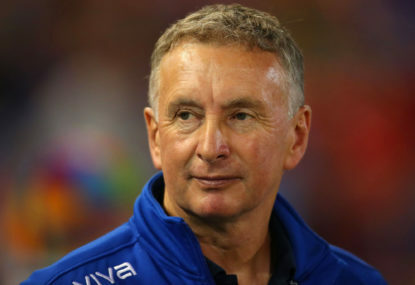 Seventh became a comfortable fit for Ernie Merrick’s men. There they would stay and the only movement possible at this late stage of the season is down, with the Wanderers a mathematical chance of jumping above them with two matches remaining. Newcastle haven’t leaked goals rampantly, with just 35 finding their way past a solid defensive unit. Nor have they managed to reproduce their 2017-18 attacking form, with their 32 goals falling well short of the 57 they managed in their historic season. The reasons for their free fall on the ladder are numerous. An inability to convert chances, the apparent existence of a disconnect in the front third and some good old-fashioned bad luck have all played a role. All the while, Merrick has stood, stone-faced and trusting of his team; willing them to unglue the gear stick from third and recapture the magic of early 2018. The fans are not happy, with many calling for Merrick’s head; an astonishing thought considering what he did for the club just 12 months ago. The most common gripe appears to be a belief that the 66-year-old failed to adequately replace those departing or further develop his tactical style and approach, knowing full well that teams would be ready for them in 2018-19. Frankly, I don’t buy the latter. Merrick is far too experienced a campaigner to rest on laurels and shots on target statistics suggest Newcastle have done enough to feature in the finals had they taken the chances before them. Merrick has another year to run on his contract and the Jets would be mad to dishonour it. Perhaps the club has suffered from the dreaded sporting hangover that can grab teams after a wave of success is enjoyed. Maybe, the hunger and desperation just wasn’t there this season. Finding it again will be the key to returning to finals action next season. 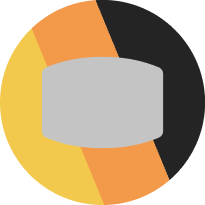 The Hunter will be watching closely, noting who is added to the fold in an attempt to make that happen.